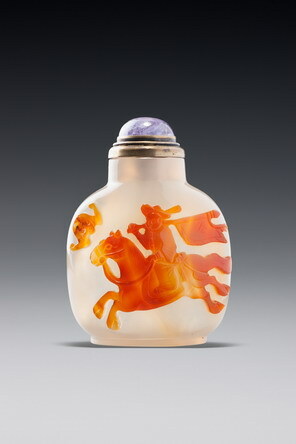 For similar bottles with the dragons but no additional decoration, see JICSBS, September 1975, p. 17, centre-right; and a monochrome one, of the same colour as this, from the Schonfeld Collection in JICSBS, Winter, 1996, front cover. The type of mark here is precisely what we would expect of a Qianlong Imperial order from a distant facility. Another group of wares with similar marks is the group of enamelled glass wares that we now know were made at Yangzhou, represented by Treasury 6, nos. 1140–1147, and that can be dated to the period from about 1770 to 1799. Fuzhou lacquer bottles represent a third group. An intriguing feature of these ‘distant’ Imperial marks is the quality of the drawing. Seal script, like any other script, takes a practised hand to write convincingly, and among the earlier examples from Jingdezhen, including some magnificent bottles produced under the watchful eye of Tang Ying, if not from his hand, are some rather shaky marks. Later Qianlong marks from Jingdezhen are often better controlled and more precise. The Yangzhou marks, where large orders meant that whoever wrote the marks had plenty of practice, are also usually drawn convincingly, whereas at Fuzhou, where marks are an exception rather than the rule, they suggest a calligrapher who is copying an example as best he can but is not accustomed to writing these characters in seal script. It is a game attempt, and the size, formalization, and layout of the mark is exactly like those found at the other two centres; it is just a little shaky and not quite as elegant as it might have been. The stopper is the standard Fuzhou stopper, although the jadeite finial and the surrounding formalized floral design represent rare departures from standard practice. Oddly, its colour doesn’t quite match the bottle, as it has more yellow in it; nor is it of precisely the same diameter, being a little smaller. If it is not the original for this bottle, it is certainly an original for a similar, early example. For an example of the more standard form of painted lacquer from Fuzhou, see , Lawrence 1996, no. 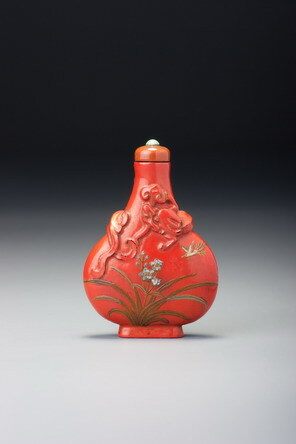 13, and for another painted bottle from the Eric Hancock Collection, with a similar palette used for the floral design, see Sotheby’s, London, 7 June 1990, lot 213.